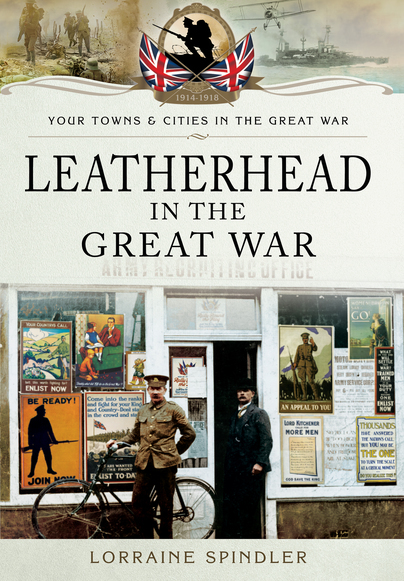 You'll be £6.00 closer to your next £10.00 credit when you purchase Leatherhead in the Great War. What's this? At the beginning of the twentieth century, Leatherhead was alive with celebration. The Boer War had ended in May 1902, King Edward VII’s Coronation followed in August and the had town blossomed into one of prosperous development. Things quickly changed when the war broke out in 1914, leaving the town papered with recruiting posters and swarming with soldiers. The upheaval was especially felt by the local families as they initially waved off over 400 Leatherhead men into the forces. Those left behind attempted to live a normal life in extraordinary circumstances, with Zeppelin raids in nearby Guildford and Croydon, which encouraged Leatherhead’s newspapers to offer insurance against the destruction of homes, the banning of lights after dark and fines for those who ignored the dictates. Added to the locals’ distress was the news of the high casualty rate of local soldiers and those previously billeted in the town, wiped out at the Battle of Delville Wood. The spring of 1918 felt especially bleak with shortages of food, labour, fuel and little prospect of an end to the conflict. However, later that year the end of war was finally declared. Of the 983 Leatherhead men who served, 163 were dead. On 19 July 1919, Leatherhead joined with the nation to celebrate peace. A lunch for returning servicemen was laid out and a procession of over 2,000 Leatherhead residents proceeded to Randalls Park. As the Silver Band played the town rejoiced with fireworks, dancing and the customary bonfire. Though warmed by the flames of celebration, Leatherhead was irrevocably altered. ...The book is well written and concise with a significant number of photographs of people and events covering the difficulties of living and working, the coming of large numbers of soldiers to train and the establishment of major military hospitals. Problems of refugees and enemy aliens are addressed as were the spy scares that took up so much of police time. Loss, remembrance and returning soldiers together with a photographic record of the memorials in the town are the subjects of the final chapter. Lorraine has studied European history, genealogy and military history. She began her career with Reed Business Publishing, before becoming a founder director of the academic distribution company, Bofin Books. She is the curator at Leatherhead Museum, responsible for the First World War Centenary exhibitions and organizes a First World War genealogy investigation team at Dorking Museum. She currently runs regular guided battlefield tours to Ypres and the Somme, weekly classes in local history and genealogy, and is researching Canadian soldiers and SOE spies based in Surrey during the Second World War.